Did you grow up watching MTV Cribs and always wanted a personal chef at home? If you answered Yes, the best thing to do is to hire Nabeel, better known as Chef Naughty Rabbit, to cook up a storm for you. At S$75 per pax, you will get a three-course meal prepared right before your eyes at the comfort of your home. 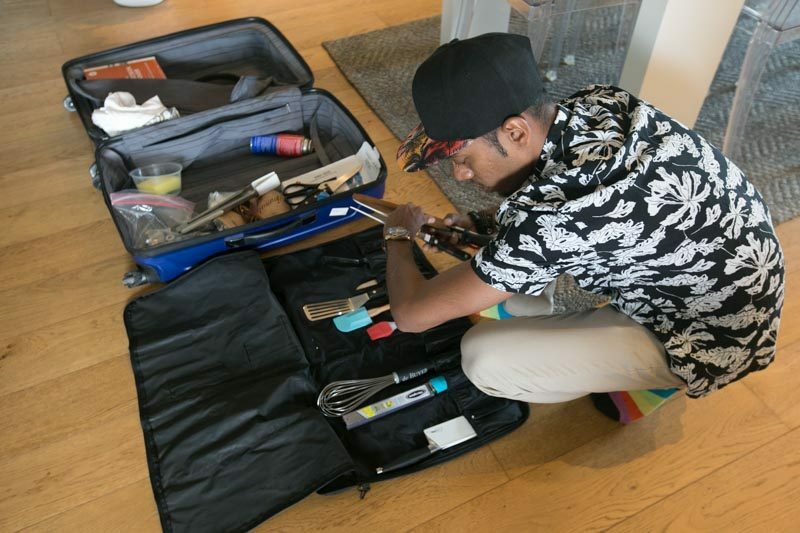 Nabeel comes with a luggage set full of cooking tools and equipment. The menu is set for now and diners will get to choose a lobster option in the future. Having studied in At-Sunrice GlobalChef Academy, his cooking style comes from a myriad of working experience, such as Bread Street Kitchen and Publico. We sat waiting in anticipation as he lay out his equipment and set the table. The meat is sous vide and as for the steak, it has been in the water bath for 10 hours prior to coming here. For the uninitiated, sous vide (pronounced sue-veed) is a cooking technique that provides consistency and delivers precise temperature control for cooking. It is a convenient way to cook as it doesn’t require constant attention, unlike conventional cooking. The best part, the meat will be moist and juicy! The meal started with Blow-Torched Squid with The Chipotle Glaze served with a side of pico de gallo. The squid is torched in front of you and if you’re worried about smoke filling up your house I can assure you there was none of that. What filled the house instead was the sweet smelling caramelising of the chipotle, whetting your appetite. The smokiness of the squid hits my palate and it was bursting with sweet juices as I devoured it. The meat wasn’t rubbery and the flesh was so tender that it pierced easily with my fork. The pico de gallo is made up of chopped tomato, onion, cilantro, fresh serranos, salt, and lime juice. A staple in Mexican cuisine, this salsa was a nice combination as it balances out the sweetness of the squid. You can expect a burst of flavours on your taste buds. Well done for the first course! Just take a good look at that fat slab of meat! The second course is a Dry-Age Chianina Ribeye served with a side of pomme puree. Chianina is one of the oldest breed of cattle, renowned for their tender and tasty meat. The meat has been sous vide for 10 hours to get it perfectly cooked from edge to edge. The meat has been simply seasoned with salt, pepper, garlic and thyme to allow its natural taste to shine through. The meat is cooked medium rare, revealing a lovely pink centre and evenly browned sides. The meat is unbelievably juicy, tender and moist. The seasoning was done just right and its deliciousness floored me. There wasn’t anything to complain about the meat and I definitely could get used to having a personal chef at home. The pomme puree or better known as mashed potatoes is hands down one of the best ones I’ve ever tasted; it was silky smooth, creamy, a little savoury and did not get jelak. It even got a stamp of approval from my French buddy who was dining together with me. Saffron was used instead of vanilla for the crème brûlée. Just so you know, the price of an ounce of saffron can fetch up to S$500, making it one of the world’s most expensive spice. The dessert received mixed reviews — I loved the saffron’s subtle earthy flavour that went well with the sweet and creamy dessert. On second taste, there was a little savoriness which I find interesting for a dessert. However, my dining partner thought it could use more mint as it can get a bit too sweet for his liking. My concern was that the strong minty flavour would nullify the presence of saffron which is the main factor of this crème brûlée. To each its own! The pampering doesn’t stop when the meal ends, you can sit back and relax while Chef Naughty Rabbit does the dishes. How nice is that? I can proudly say I’ve ticked one thing off my bucket list: to have a private chef cook for me. Sure, I ain’t no Crazy Rich Asian, but every once in a while we deserve to treat ourselves and that’s what Chef Naughty Rabbit is here for. I enjoyed the process of the three-course meal, watching him prepare and cook the food right before us added to the experience that I’ll hold on to until I can afford to splurge on myself again.